I recently became aware that I had missed one additional comic book that had come into my household a few months earlier. It was this issue of SPIDEY SUPER STORIES, which was bought for my younger brother, Ken. It did eventually end up with me as well, but only after it had been reduced t tatters, the cover and outer wrap both gone, which may be why I didn’t recall it. Also, it was written way below my then-current reading level, so that too may have made it less noteworthy to me. In any event, let’s take a look at the thing. I’ve written much earlier on this page about how much I liked the Electric company TV series which ran on PBS (Channel 13 in my area, WNEW). And even though I wasn’t a Marvel fan at this point, the best and most noteworthy episodes were those that featured a Spidey Super Stories segment on them. (Though I must confess I was generally more enamored of their home-grown animated super hero, Letterman.) It was still such a rarity to see a super hero depicted in real life that those skits were a real treat, for all that they were very simplified and even silly. The comic book was no different. John Romita has told me that he was proud to have been associated with SPIDEY SUPER STORIES and the CTW crew whose mission to encourage children to read resonated with him. By this point, though, several months in, John wasn’t all that involved apart from doing covers and the occasional touch-ups. But he did mention that Marvel’s deal to allow CTW to feature Spidey on the Electric Company was virtually a gratis deal, as were the terms of publishing behind SPIDEY SUPER STORIES, the easy-reading children’s tie-in comic book. It was considered a public service then, even by tight-fisted Marvel. (As well as a way to expose potential young readers to the Marvel characters early. 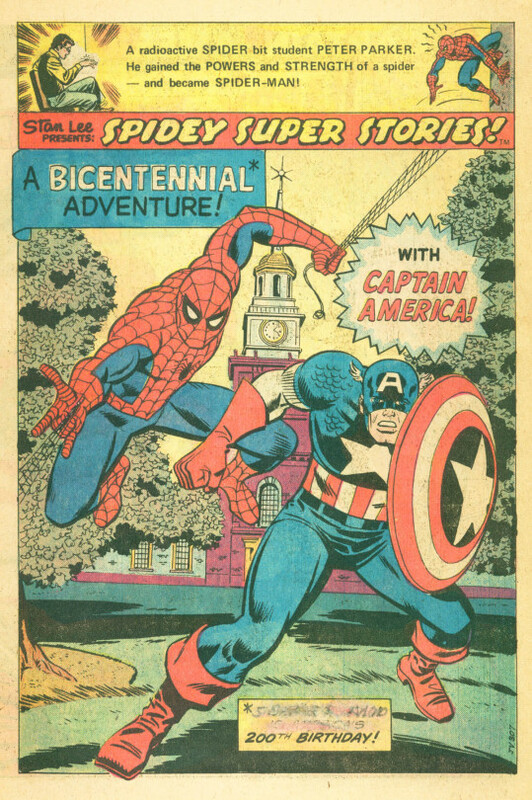 This particular issue featured a book-length epic celebrating the nation’s bicentennial, which was all over the place in 1976. Doctor Strange sends Captain America and Spider-Man back in time so that Cap can met his heroes, the men who helped to found our nation. 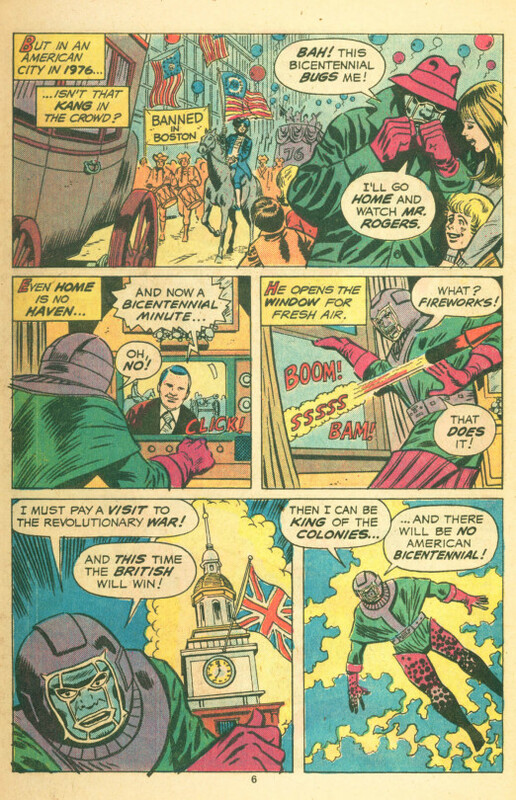 But Kang, irritated by all of the bicentennial celebrating, vows to change history so that the British win. 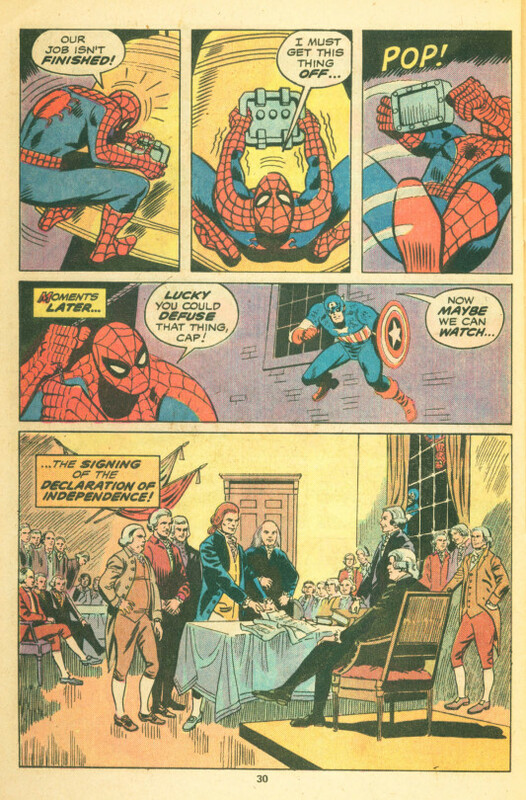 And so, the time-travelers end up on the eve of the Boston Tea Party, and Spidey and Cap foil Kang’s plans to prevent it. This is about as succinct an explanation of Kang as you’re ever going to get! 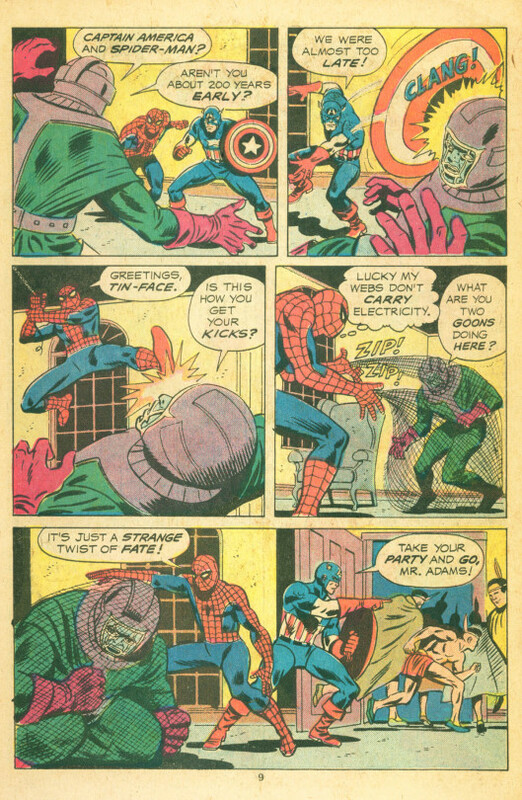 At the mid-point, the story is paused for a second tale, this one an adaptation of one of the live action Spidey sketches that ran on the Electric Company. 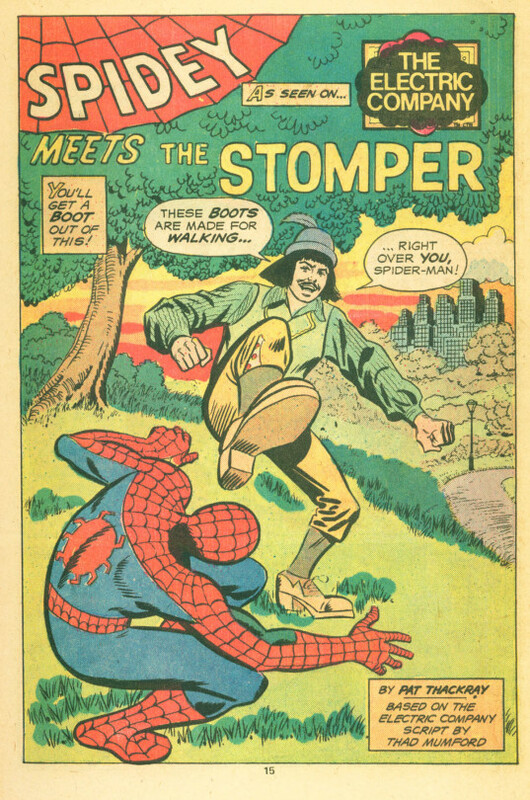 In this one, Spidey battles the Stomper, who uses his huge feed to stamp on ceilings, step on toes, stomp on mail, and just generally step on the little people all around him. It doesn’t take long for Spider-man to catch up wit the Stomper, web him up and remove his oversized shoes, rendering him helpless. After that short diversion, the larger story picks up again, this time with Kang appearing in 1775 and destroying all of the lamps in the tower meant to signal Paul Revere’s famous ride. 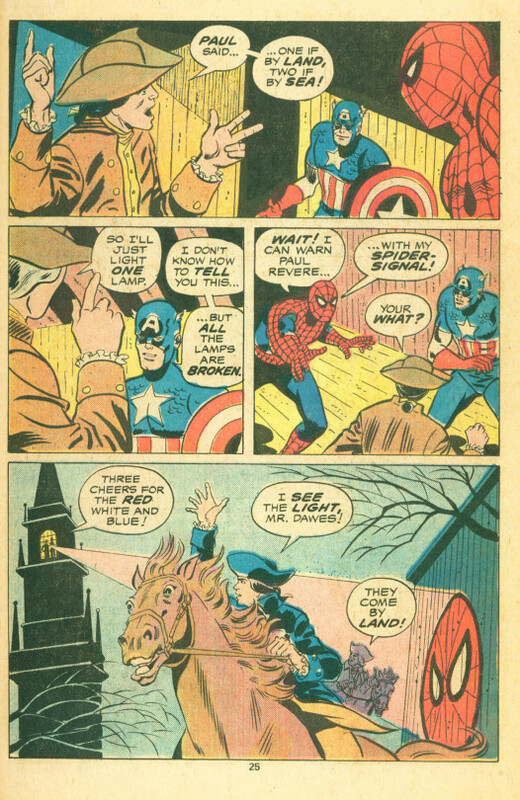 Dr Strange transports Spidey and Cap there, they beat the heck out of Kang, forcing him to retreat, and then Spidey uses his spider-signal to substitute for the destroyed lamps, thus insuring that the Colonial Militia is warned and ready for the arrival of the Redcoats. The final act takes our heroes to Philadelphia in 1776, where Kang intends to prevent the signing of the Declaration of Independence with a bomb attached to the Liberty Bell that will wipe out the city. But Cap and Spidey settle his hash, Spidey webs him up and Cap is able to defuse his explosive, thus allowing our champions to witness the historic moment firsthand. 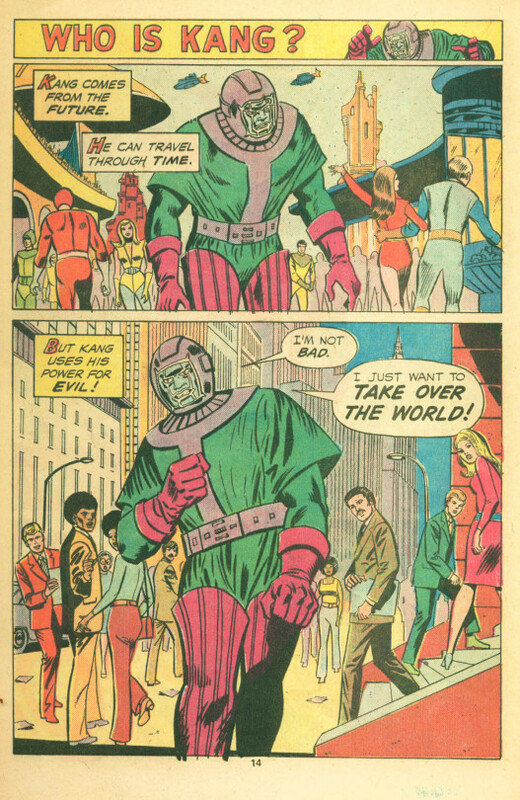 Then everybody, even Kang, is returned to the present to conclude the bicentennial party that opened the issue.